Looking for a sedan that offers more than good gas mileage? The 2018 Chevy Malibu technology provides you with the entertainment you want and the assistance you need while you’re on the road. You’ll love the touchscreen display that turns your center console into an entertainment center, and safety monitoring systems help protect you and loved ones on the go. Learn more before taking the new Malibu on the road for a test drive at Nimnicht Chevy, Jacksonville’s #1 Chevy dealer! Set limits for young drivers so you can feel better about lending your teen the keys with audio silencing until seatbelts are secured, speed limit settings, and more. Connect up to seven devices for 4G LTE Wi-Fi hotspot capabilities, letting you take business and pleasure on the go. Check the weather, make a phone call, stream audio, and more from your touchscreen display mounted on the center console. When the rear door is opened and closed before heading out, you’ll receive a chiming alert to check the back seat as to not forget anything or anyone. 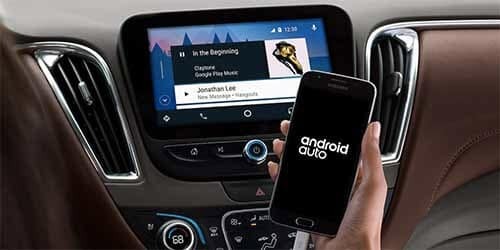 The new Chevrolet Malibu allows you to play your favorite music by selecting audio streaming apps or stored songs from your touchscreen display, or you can enjoy commercial-free talk shows and music channels from SiriusXM Satellite Radio. Go cordless by adding the wireless charging pad that’s compatible with many modern smartphones so you can enjoy features like hands-free texting and phone calls while commuting from Orange Park without draining the battery. A rearview camera display lets you avoid accidents when you’re in reverse, and other driver assistance technology like Forward Collision Warning helps protect you, too. Unfamiliar with any of these new features? Our Chevy Connection Center will fill you in by helping you figure out all that the new Malibu can do! Schedule an appointment with one of our helpful sales associates to take the 2018 Malibu on a test drive and try out the technology. We’ll help you find and finance the tech-savvy car of your dreams! If there’s any questions we can answer about how the Malibu excels against the Nissan Maxima or against the Honda Accord, please don’t hesitate t0 contact us online. Ready to visit us for a test drive? We’re just a short trip from St. Augustine!